Nowadays almost every digital piano is equipped with a headphone jack where you can plug a pair of headphones and play at any time of day and night without disturbing anyone else. It’s probably the most important feature of digital pianos that an acoustic piano cannot offer. Unfortunately, people often prefer to use cheap earbuds or low-quality over-ear headphones bundled with a digital piano rather than high-quality headphones with comfortable design and full, accurate sound. In fact, choosing the headphones that can accurately and naturally reproduce piano sound is no less important than choosing a digital piano itself. The right pair of headphones will allow you to hear all the subtle nuances of sound that are impossible to hear through piano’s speakers. What are the best headphones for digital pianos? The truth is there are no “perfect” piano headphones, and every pair has its pros and cons. However, there are a number of aspects that make one set of headphones more suitable for instrumental/classical music than another. 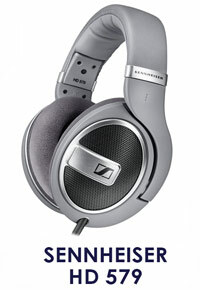 Update February 24: The Sennheiser HD 599, which I personally own and recommend, are NOW on sale on Amazon (27% off). Sound quality and comfort are the two main things I was looking for, trying to find the best headphones to use with digital pianos. Sound. Headphones that offer neutral well-balanced sound with even frequency response are best suited for piano sound. 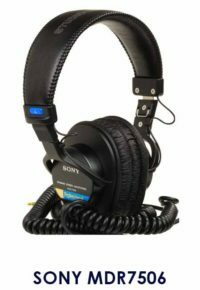 DJ headphones including popular bass-oriented headphones like Beats, Sony (Extra Bass line) should be avoided. Comfort. It’s likely that headphones will be used for long periods of time, so each pair I’ve selected is comfortable for extended sessions and exert just the right amount of pressure on the head. There are also some other important characteristics to consider, such as soundstage, isolation, leakage, etc., and they’re hugely depend on whether the headphones have open- or closed-back design. So in the next section, we’re going to talk about types of headphones and what type is the best when it comes to digital pianos. What headphone type to look for? 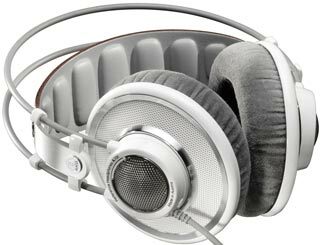 There are different types of headphones including earbuds, over-ear, in-ear and on-ear headphones. 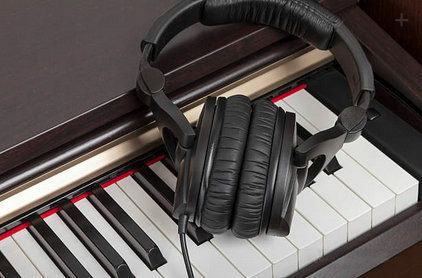 While in-ear and on-ear headphones are not the most suitable options to use with a digital piano, over-ear headphones are exactly what we need. Each type has its benefits and drawbacks so our “top 5 list” includes both closed- and open-back headphones for you to choose what works best for your needs. This is most probably the most popular and familiar to you type of headphones, which you can find at any electronics store. Unlike open-back, closed-back headphones have a solid outer shell, which doesn’t allow air to pass through the cups. From the sound perspective, sealed ear cups provide more powerful and deep bass compared to the open-back cups. But the main advantage of closed-back headphones is excellent noise isolation. Closed-back cups block out a lot of outside noise, which makes such headphones much more suitable to use in noisy environments (background noise of TV, kids, traffic, etc.). 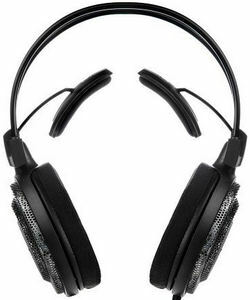 They are also great to use in the office and for commuting, while open-back headphones are rarely used outside the home. Not only does the closed-back design blocks out the ambient noise, but it also prevents music from leaking into your surroundings, so others in the room will be able to sleep, read, watch TV without a problem. However, there are some trade-offs for using closed-back headphones. Firstly, due to the lack of air flow, closed-back headphones tend to trap heat and moisture and, therefore, they are not very comfortable to wear for extended periods of time. After a few hours of wearing you might want to take a break and let your head and ears to rest. But, not all of the closed-back headphones are created equal. 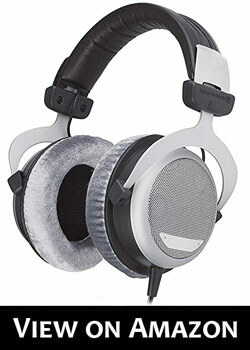 Those that have bigger ear cups and softer padding tend to be more comfortable than others, but still, they’re usually not as comfortable for long sessions as open-back headphones. 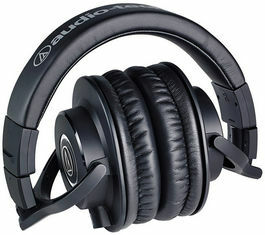 Secondly, the soundstage, which is the perceived depth and width of the sound, of the closed-back headphones tends to be smaller and less airy/open compared to open-back headphones, which tend to produce a bigger, “live” sound. The sound of the closed-back headphones, on the other hand, can be described as coming from inside your head, like your own thoughts, rather than playing around you. 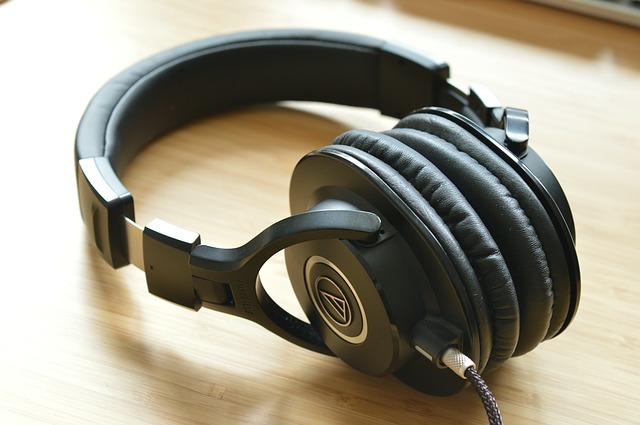 Open-back headphones are less common than closed-back partly because of its main disadvantage – the lack of isolation, which in many circumstances can be a real problem and makes this headphone type not suitable for casual use. Nevertheless, many musicians and audiophiles prefer this type of headphones as they tend to provide more natural sound and wider soundstage making the listening experience more enjoyable. The reason for poor isolation of open-back headphones is their ear caps have openings (perforations, grills, etc. ), allowing air and sound to pass in and out of the headphone cups. As a result, you’ll be hearing all the sounds from the surrounding environment, sometimes slightly reduced (depends on the model), which may really be a problem if you leave in a noisy environment (noisy neighbors, a lot of traffic noise, kids, etc.). At the same time, it may also be an advantage as you’ll be able to hear everything that’s going on around you. It’s particularly useful if you have little kids or other people you need to look after. Another important drawback is that open-back headphones tend to leak a lot of sound into the surrounding area so that the audio from the headphones can be heard by other people nearby. It makes opened-back headphones a bad choice for using in public places and commuting. At the same time, there are two big benefits of open-back design. Firstly, due to the air flow, the excess heat and moisture easily escape the cups, making open-back headphones more comfortable to wear for extended periods of time. You can wear them literally for hours without fatigue or discomfort. Secondly, open-back design usually provides wider and more open/airy soundstage than closed-back. It feels like the musicians are sitting around you and playing live, which make the sound more natural and clear. It’s certainly more enjoyable than “in your head” experience of closed-back headphones, especially if we’re talking about listening to instrumental and classical music. 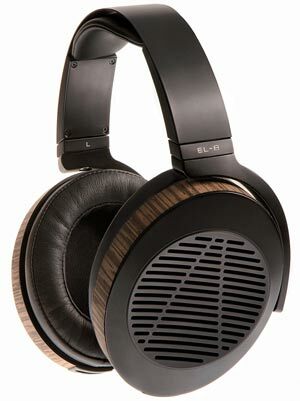 Beautiful, spacious sound is probably the main reason why many high-end, audiophile headphones have open-back ear cups. And since we’re are looking for the best headphones to use with a digital piano, poor isolation isn’t necessarily a deal breaker as it all comes down to the environment you live in. 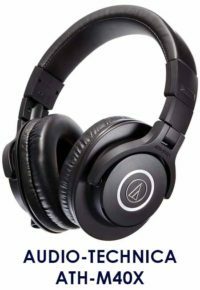 Now that you know all the benefits and disadvantages of both types of over-ear headphones we can move on to the 5 best piano headphones on the market. We’ve tested 14 best potential headphones and selected 5 winners that meet the requirements best. The keyboard we tested the headphones with was the Kawai ES110. There are closed-back and open-back headphones depnding on whether the ear cups are completely sealed on the back (solid shell) or have perforations/grills, allowing air/sound to pass in and out of the cups. The frequency range the headphones can reproduce from low bass to high pitch frequencies. The wider the range the better. Humans generally can't hear anything below 20 Hz and higher than 20,000 Hz , but many headphones still have wider frequncy ranges. Low impedance headphones require less power to deliver high audio levels than headphones with high impedance, thus perfect for devices with weak amplification (mp3-players, phones etc.) High impendance (70+ Ohms) is reccommended to use with well-amplified sources. For digital pianos, the range of 32-65 Ohms is optimal. The ATH-AD700X are one of the best open-back headphones you can find in the 100$ range. 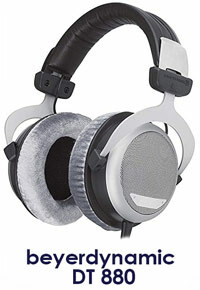 These are open-back audiophile headphones that not only deliver clear and detailed sound but are also very comfortable. Sound. The 53 mm drivers and bobbin-wound CCAW voice coils provide an incredibly open and airy sound; the soundstage is probably the best in this price range. The sound of the ATH- AD700X can be described as neutral and well-balanced with less prominent bass. Such a sound signature is perfect for a digital piano sound. The treble range though is not as well-balanced and clear as bass and mids, but it still shows above-average performance. The instrument separation is great with these headphones, allowing you to experience the music in amazing detail and depth. Design. The ATH- AD700X are pretty big, but not heavy and weigh only 9.35 oz. They are also very comfortable with their self-adjusting 3D wing support that reliably fixes the headphones and prevents them from falling down. The headphone’s ear cups exert just the right amount of pressure on your head, so you won’t feel any discomfort even after a few hours of wearing. The open-back cups with stylish aluminum perforations ensure sufficient ventilation for your ears. With this also comes very poor isolation from ambient noise and high amounts of sound leakage. So the headphones are not great to use in public places and noisy environments. For home use, they’re perfect though. The AD700X has 3.5 mm plug and comes with an 1/4” (6.3 mm) adapter, so regardless of whether your digital piano has 3.5 or 6.3mm headphone jack you’ll be able to plug them in. The ATH-M40x are professional monitor headphones with a closed-back design. Sound. Unlike many other closed-back headphones, the M40x doesn’t put emphasis into lower frequencies and has well-balanced sound across the whole frequency spectrum. The soundstage seems a bit narrower and less airy compared to the open-back headphones, but still, the sound of the ATH-M40x is very accurate and detailed, which is what these headphones are liked for. Design. In addition to a sleek and attractive design, the headphones feel very sturdy and well put together. The plastic is pretty hard, plus the headband is reinforced with a metal frame. The ATH-M40x’s headband and ear pads are made from professional-grade materials, offering high comfort and durability. The sealed ear cups block out outside noises pretty well though it’s not enough for comfortable listening in trains, planes, etc. The sound leakage is low and allows people around to hear the sound from the headphones only at high volume levels. The headphones come with two cables (straight and coiled), which you can use interchangeably. The package also includes 1/4” (6.3 mm) adapter so regardless of whether your digital piano has 3.5 or 6.3mm jack you’ll be able to plug them in. 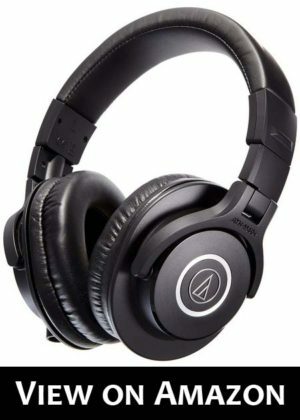 You might also have heard of the even more popular ATH-M50x (next model up). And the reason why I put the ATH-M40x in this list and not the ATH-M50x is that the ATH-M40x tend to provide a little more balanced and neutral sound, which is great for classic and instrumental music. The ATH-M50x, on the other hand, tend to color the sound a bit, offering a stronger, more emphasized bass response. It’s not always a good thing, and for digital pianos, the M40x with its neutral sound would be a better choice, not to mention the M40x is around 50$ cheaper than the M50x. 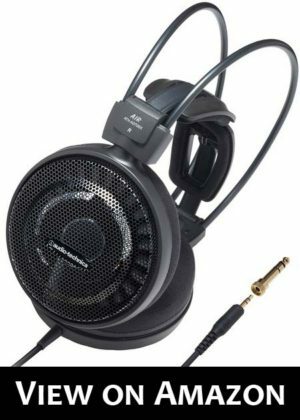 The HD579 audiophile headphones offer phenomenal sound and comfort for a very nice price. 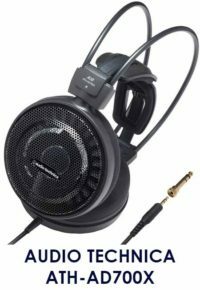 A while ago the price on them was something around 200 bucks, which is a reasonable price for them, but now you can find the HD579 for around 100$! Design. The padding on the HD579 is super comfortable. The headband and ear pads have very thick, luxurious velour padding, which feels very soft and pleasant and allows your ears to breathe! You can wear them all day long without feeling any discomfort or fatigue. After a while, you will start to forget that you’re wearing them at all. The HD579 don’t fold out like some other more portable headphones out there. They also have quite big ear cups, which makes the headphones pretty bulky and thus not very portable, but again from the comfort perspective, it’s a big plus. Sound. The HD579 are open-back headphones, so they leak a lot of sound, which people near you will be able to hear. But at the same time you get wonderful 3-deimensional soundstage; instruments come from all directions providing an amazing sense of depth and separation. The headphones provide neutral and well-balanced sound. They have clear highs and mids, and the bass is very good, considering these are open-back headphones. The bass isn’t over emphasized though, which is important for an accurate reproduction of music. The HD579’s cable ends in a 1/4” plug, so in most cases, you’ll be able to connect them to a digital piano without using an adapter. If your digital piano is only equipped with a 3.5mm jack, it’s okay as well as the kit includes an 1/4” to 1/8″ adapter. Update December 12. As for now, you can get them on sale on Amazon for a very attractive price. 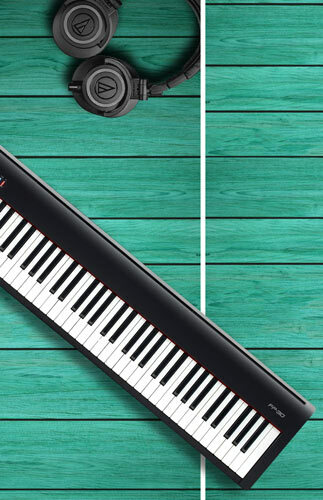 If money is not a problem and you want to get the best possible sound out of your digital piano, you might want to consider the superior HD599 (next model up). The HD599 offer a bit more spacious soundstage and a more refined sound. You’ll also get more luxurious materials and a premium look, but in terms of comfort they are very similar to the HD579 . It would be a big mistake not to include the Beyerdynamic DT 880 Edition in this list. 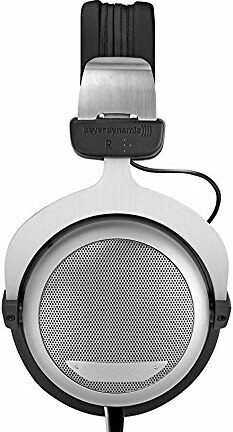 For those who have never heard of Beyerdynamic before, this is a German brand founded in 1924 that has been making pro-grade audio equipment for almost a century. 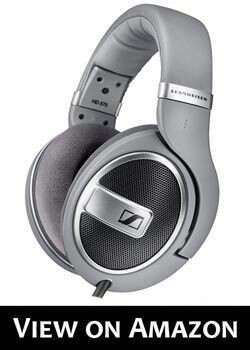 The DT 880 are the direct competitor to the Sennheiser HD 579 and HD 599. They have a lot of similarities, starting with the design and ending with the sound signature and quality. The Beyerdynamic DT 880 Edition are semi-open back headphones, so they leak a little sound and isolate a tiny bit better compared to the open design headphones. Otherwise, I’d still wouldn’t use them in noisy environments, and especially outside. The DT 880 are available in 3 modifications with different impedances: 32 OHMs, 250 OHMs, and 600 OHMs. Unless you’re going to use headphones in a studio with higher-voltage pro/amplified equipment, I highly recommend going for the 32-ohm version. It will work best with consumer-grade devices such as mp3-players, laptops, and, in our case, digital pianos. Design. The DT 880 are built to last! Just like the majority of Beyerdynamic headphones, the DT 880 are made in Germany. The headband is made of metal and covered with soft leather. In terms of comfort, they’re equal to the HD-579/HD-599 and are among the most comfortable headphones on the market today. Therefore, the DT 880 would be a great pick if you’re going to use them for extended periods of time. You can literally forget that you wear them, which is, for me, the main benchmark for comfortability. The sound through the Beyerdynamic DT 880 is just beautiful. Big, spacious soundstage, neutral sound signature, and high accuracy make them ideal for classical pieces, and actually any kind of genre. All in all, the Beyerdynamic DT 880 are among the best headphones you can get under $300. 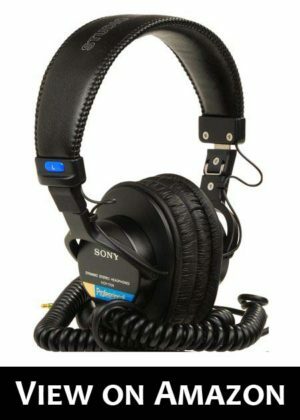 The headphones come with a long 3 m (9.8ft) detachable cable ending with 1/8″ plug (3.5 mm). The 1/4” adapter is also included so you can use them with your digital piano out of the box. These are professional high fidelity headphones that have been around for quite a while. The MDR7506 are legendary, industry standard headphones trusted by many audio professionals in studios all around the world. Today you can get them for as little as 80 dollars. But, don’t be fooled by the price, the sound quality put them on par with 200-300$ headphones. Sound. The reason why the MDR7506 are so popular in studios is that they very accurately reproduce audio without “coloring” it, exactly as it was recorded. The headphones’ neutral sound signature allows for natural reproduction of all kinds of musical instrument sounds, including piano. The headphones offer average soundstage, it’s not as wide and deep as open-back headphones provide, but among closed-back headphones, it’s above average for sure. Design. The MDR7506 being closed-back headphones are not as comfortable to wear for extended periods of time as open-back headphones. The longer you wear them, the more warmth and heat builds up inside the cups, so you might want to take a break to let your ears rest after a few hours. The MDR7506’s movable ear cups combined with an adjustable headband ensures comfortable and secure fit for everyone. The padding is quite comfortable, but not as comfortable as the HD558’s velvet padding or the ATH-M40x’s leather pads, which provide a little more room inside the ear cups. The passive noise isolation (closed ear cups) is particularly good with these headphones. The headphones do a great job blocking out a decent amount of outside noise, providing a truly immersive listening experience. Another great thing I should mention is very low sound leakage; you’ll have to put the volume really high for others nearby to hear what you’re listening to. It enables you to use the headphones not only with your home digital piano but also outside the home environment, listening to music from your portable devices without disturbing others nearby. On the picture, you can see Adele wearing the Sony MDR7506 in the studio. I hope the article has helped you decide what digital piano headphones are the best according to your needs. As I said before there are no perfect headphones, each pair has its pros and cons and often it all comes down to one’s personal preferences and needs. For my part, I did my best to pick out, test and present to you headphones that deliver the most value for the money and reproduce instrumental/classical music as accurately as possible. All 5 headphones in the list tend to have neutral well-balanced sound with great instrument separation and clarity. You can’t actually go wrong with any of the above headphones as long as you keep in mind benefits and drawbacks of closed- and opened- back headphones. If you live in a quiet environment where no one will be bothered by a significant amount of leakage, I’d definitely go with the open-back headphones and enjoy spacious sound stage, “breathing” ear cups, and “sound around you” listening experience. For noisier environments, a pair of closed-back headphones is a better choice, which will provide a greater isolation from ambient noise, low amounts of leakage and immersive listening experience. I deliberately didn’t include super expensive headphones that cost hundreds of dollars as the difference in sounding is often pretty subtle and to me not worth extra money unless you’re a professional music producer.